I seriously forgot how much I love Deborah Lippmann “Happy Birthday”. Be prepared for Happy Birthday overload because I rediscovered it and now have worn it in 3 manicures in 2 weeks. Its the glitter that started the confetti glitter trend and I really thing that it is one of the best. While I would totally recommend picking up the OPI or Nicole by OPI rather than spending almost 3 times as much on this polish, but there’s something to be said about using the original. This is one coat, one coat! I think it also helps that this polish is now a few years old in my collection and has gotten a little thick, but its so dense and easy to work with. Like I said in my last post, all the glitter lays nice and flat on the nail and the dry time isn’t that bad. Then I thought about what polish to pair with it and I knew I had to go for a yellow. Revlon “Buttercup” is an extremely light pale yellow creme. I have to say, I freaking love this polish. It is BY FAR the easiest yellow I have ever worked with in terms of the formula. It is opaque in 2 coats, evens out nicely on the nail, the brush is one of those ultra wide OPI style brushes so its easy to apply, and it is the perfect “Goldilocks” consistency (not too thick, not too thin). Honestly, this is everything I always wanted in a yellow polish. 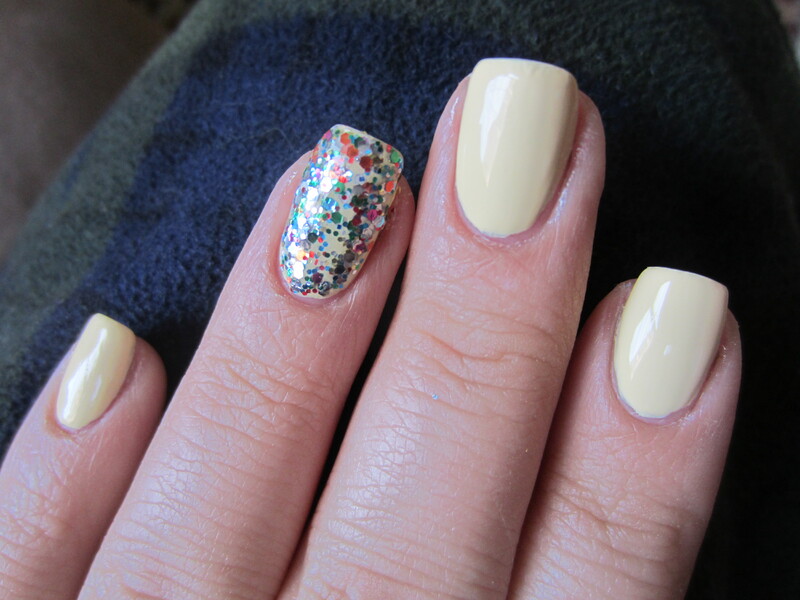 I love that it is a pale yellow and so pale that it almost looks white. It is the perfect baby chick style yellow and I have worn this honestly 4 or 5 times already. The reason I haven’t put up a picture of this manicure until now is that this polish chips like no other! I said on my YouTube channel that this polish chips and so many people said that this polish is designed to be worn with the whole “Revlon Color Stay System”. So many people told me that if you wear it with the base coat and top coat, you could wear this for 7 to 10 days without chipping. While I don’t doubt what people are telling me, I like the base coat and top coat I use and don’t want to invest another $15 in extra nail supplies just to make this polish not chip on me. This polish has chipped within a few hours on me every time I’ve worn it. I know every girls nails are different, and not all polishes work well on everyone. Also, other people have different life styles than I do and won’t experience tip wear or chips for an average of 5 days no matter what color, base coat or top coat you’re using. I’m just letting y’all know that (on me) it chips within hours. But since I love the polish so much, I’ve suffered through it and thrown the bottle in my purse for touch ups. What do you guys think? Do any of you guys have this polish? Have any of you experienced the same chipping problems I had? Have any of you tried the entire Revlon system? that is beautiful! 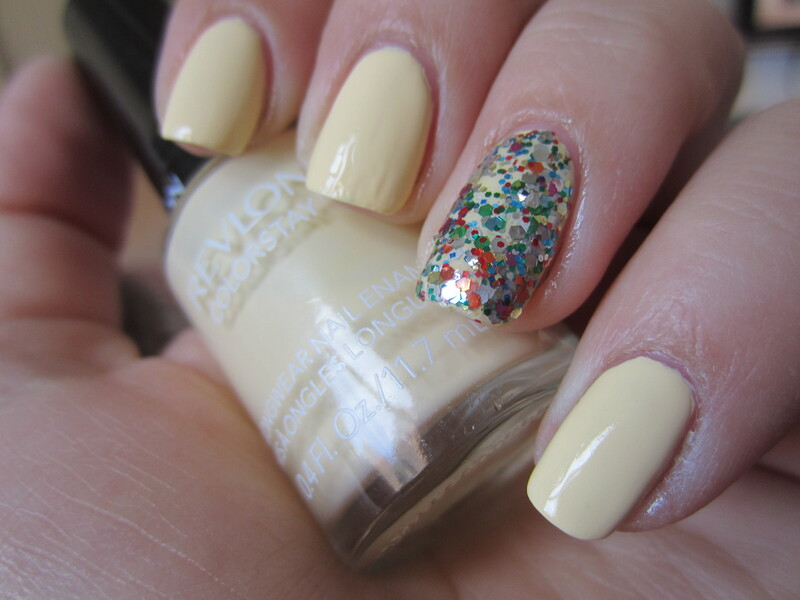 I really have to try some revlon polishes! I have been wanting this color so bad, but haven’t picked it up. I might have to pass due to the chipping!